Kielder Castle Café and Exhibition are open daily 9.30am – 5.00pm from March to October (9.00am - 5.30pm Bank holidays and school holidays). Last admission to the exhibition is half an hour before closing. Best for: Cycling, mountain biking and forest activities. Formerly the hunting lodge for the Duke of Northumberland, the Castle is now home to a variety of exhibitons. It is also the centre for cycling within the Park. Test your mountain biking (mtb) skills or start a singletrack trail (pick up mtb trail maps here too). Hire, repair or purchase bicycles. Enjoy the Minotaur Maze, part of Kielder Art & Architecture, and the children's play area. Drive along the longest forest drive in the UK (toll road) the cost would be £3.00 (£7.00 combined day parking and Forest Drive). Please note the drive is open seasonally 1 May to 30 November. Start a walk or bike ride along the Lakeside Way. 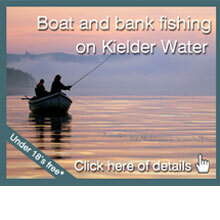 Discover the lifecycle of the salmon at the Kielder Salmon Centre. 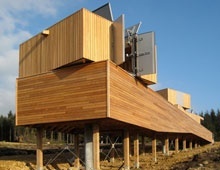 Visit the red squirrel room and great viewing hide. Get FREE entry to the Forest Exhibition. Access is through the café. Keep your eyes peeled for some of the Kielder Super Six - red squirrels, pipistrelle bats and roe deer (on the Forest Drive). For details on the Super Six see the wildlife page.